Shareholders, including Maersk and Cosco, to increase the terminal?s issued share capital by more than $48m from $137.5m to $185.6m. Shareholders in the company, including Maersk and Cosco, to increase the terminal"s issued share capital by more than $48m from $137.5m to $185.6m. 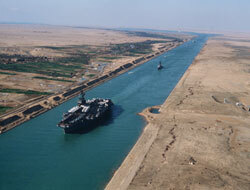 Soaring construction costs to develop the second phase of Egypt"s Suez Canal Container Terminal have led shareholders in the company, including Maersk and Cosco, to increase the terminal"s issued share capital by more than $48m from $137.5m to $185.6m. The move has cost Cosco Ports (Port Said), which owns a 20% stake in Suez Canal Container Terminal, nearly $9.6m for an additional 96,251 shares. The company, controlled by Cosco Pacific, which itself is owned by China Cosco Holdings, said the additional investment would be financed from Cosco Pacific"s internal resources. Cosco Pacific acquired its stake in November last year from IFU-Danish Development Bank. The other shareholders in the terminal have subscribed for extra shares on a pro-rata basis. APM Terminals is the largest shareholder, with a 55% stake. Other stakeholders include Suez Canal Authority, with 10%, and National Bank of Egypt, which has 5%, while the remaining 10% is held by private sector interests in Egypt. Cosco Pacific vice-chairman and managing director Xu Minjie said the cost of building the second phase, which was expected to be about $1bn, had climbed ?as a result of increases in the price of construction raw materials?. Rising prices are understood to have affected the first main construction contract on the second phase for the 1,200 m long quay wall that was signed in September with China Harbour Engineering. Phase two"s first berth is due to become operational in the second quarter of 2010, while the remaining berths are expected to be completed by September 2012, when phase two will double the terminal"s existing capacity to 5.1m teu.